There was a big hue and cry in some sections of the media when the Service Chiefs decided to request the govt to rectify the PayCom anomalies before these were implemented. The said decision was seen as a contempt of authority of the govt and a (non-existent) wedge was sought to be created within the defence establishment, a journalistic act which was of course based on conjectures and more contemptuous than the imaginary ‘rift’ itself. Now where is Mr Gupta ?. A duly constituted Group of Ministers under the aegis of the Prime Minister of the Republic of India, has agreed to upgrade Lt Cols to Pay Band-4 and the same has been duly deliberated upon and approved by the Raksha Mantri, the Ministry of Defence and the Services. Though there is no hitch, the case, in all probability, is with the finance babus who are sitting on it before the arrears are finally disbursed. Now isn’t this contempt and derision of the directions of the govt, the PM, the GoM, the RM, the MoD, the Service Headquarters, conveyed oh so many months ago ? And what jurisdiction do the Ministry of Finance and the Department of Expenditure have to comment on the relative status of military personnel and civilians as has been happening ? Isn’t that the duty of the Ministry of Home Affairs and the President’s Secretariat ? And who gave the authority to our finance experts to question the MoD on the latter’s (correct) interpretation of the deputation clause ? Aren’t they exceeding their brief and having a free run by not giving effect to a lawful command from the highest echelons of the govt ? Any answers Mr Gupta ? Will we ever get to read about this in your newspaper ? A message and a request to readers : I also urge members of the military community to look beyond PB-4. Isn’t there much more to life ? This is something which is eventually (and soon) going to reach your accounts and that too with arrears, so why sit on a short fuse ?. Catharsis in the form of offensive behaviour would not lead to early finalisation of the issue, and neither does it show the military community in good light. So my request is to stay calm and relax, and go easy on the chat box with those caustic comments. All individual mails on PB-4 issue can also not be possibly replied to and please do not mind that since I am in a demanding profession and though I try to update you as promptly as possible; I am not in a position to reply to separate mails on the same subject time and again. I wish there were more than 24 hours in a day, but there ain’t. For determining the grades for the defence services, the 6th CPC has drawn a parallel with the Indian Police Service. In fact, for the first time, this pay commission has linked military salaries to Police grades using the latter as the backdrop. The police nomenclature of appointments has changed over the years. If indeed a comparison was to be made, it should have been made with the position in the hierarchy and not with the mere name of the appointment, which after umpteen number of redesignations and upgradations, has lost its inherent relevance. Hence if the highest police rank of a state was equated with a Col initially, what made the military rank go down on the status and pay ladder – is there any explanation in any pay panel report ? No, not at all. If thereafter, for a long period of time, an IGP was the apex police officer looking after the policing of an entire state and was equated with a Maj General, why is now a Maj Gen placed fourth from the top as far as comparison with the police is concerned. In fact changes in nomenclature and upgradations on the civil side without any actual functional effect on civil services have resulted in an indirect mess in the defence services. The same happened in case of police and also in Secretarial appointments under Govt of India as is clarified in this earlier post on this blog. For example, when the initial Secretarial hierarchy of Asst Secy to Govt of India / Under Secy / Addl Dy Secy / Dy Secy / Joint Secy / Addl Secy / Secy to Govt of India was over the years redesignated and changed to Under Secy to Govt of India / Dy Secy / Director / Joint Secy / Addl Secy / Secy / Cabinet Secy, the powers that be stuck on with the Major General = Joint Secy to GoI equivalence from the old hierarchy and simply pasted it in the new hierarchy not realising that the old Joint Secy (with about 30 years of service) which was the Fifth Secretarial rank initially had now been redesignated and replaced on the fifth step by the Addl Secy to GoI. In fact, many would not know that the old Dy Secy to GoI is now known as the (present) Joint Secy to GoI, both on the fourth step of the ladder. Hence, the linkage of the rank of Maj Gen should have ideally been with the fifth step of the hierarchy and not with the mere nomenclature of the appointment. The solution hence would be to link military ranks with functional equations and position in hierarchy of civil grades and not with nomenclature or in some cases the exaggerated redesignated name of a post. This can only happen if there is a formulation of a committee to look into the effect on the military structure each time there is a cadre restructuring or upgradation on the civil side. For example, if a Maj Gen was equated with the highest police rank, then irrespective of change of the name of designation on the police side, the said rank should have remained equated with the corresponding highest police rank, whatever it may have been named, unless there was a proper redefining of roles and status by a lawfully constituted body. If a Maj Gen was equated with the fifth step Secretarial rank under the Govt of India hierarchy earlier, then the same should have been the equation irrespective of change in nomenclature and re-designation on the civil side. The police example has been highlighted by our regular visitor Aditya on the blog time and again and I thought it would be interesting to roughly highlight how police ranks have compared with the Army down the ages. Military moms (and moms to be) have a reason to be happy. The govt has finally enhanced fully paid maternity leave from the existing 60 days to 180 days bringing it at par with civilians as per 6th CPC recommendations. The same is applicable to all, including Short Service Commissioned Officers. The maternity leave shall be valid for two children. The good news is that even those officers who have already joined duty on or after 01 Sept 2008 after availing the previously existing 60 days leave, can still avail the balance. Good gesture this one. The govt letter can be viewed and downloaded by clicking here. Oh Yes, and by the way, this blog reached the One million (10,00,000 / Ten Lac) hits mark yesterday. First of all, let me introduce Abhinav Kumar to you. He’s an IPS officer of the Uttrakhand cadre and a thinking cop for sure. Before joining the IPS, he was a journalist with India Today and readers would be happy to learn that he is BA (Hons), MA in Philosophy and Economics from the University of Oxford. Well, all of you saw my rejoinder to Abhinav’s piece touching the military and I do also hope that you glanced through my introduction to my disagreement on his write up when I said that I had a liking for the work of his pen. My views were not at variance with him per se but with one aspect of his article dealing with protocol addressed by me here and here. Abhinav has responded to the issue at hand. Before readers peruse his reply, I would like to point out that this is being initiated for a meaningful debate on the subject and I would not expect personal comments or remarks deprecating any particular service. Also as regular visitors would know, this blog gives utmost importance to the freedom of expression and personal opinion, hence both sides of the motion have to be equally respected and tolerated. Before I put across his letter for you, you may like to see his earlier work especially on the inherent superiority granted to the IAS by the 6th CPC, his insightful piece on our society and institutions with Nithari as the backdrop and on the life of a Police Constable. Never known to mince his words, the officer very bravely faced the tirade of some old school babus after his ibid article on the pay edge to the IAS was published. The show cause notice issued to him on the recommendations of the Department of Personnel and Training was however stayed by the Hon’ble High Court of Uttrakhand. 1. Is it the case that the Warrant of Precedence at the time of Independence should be held sacrosanct and held as the basis of determining relative pay and status for all times to come? You may like to look at other mature democracies and see how they accord pay and status amongst different public services. Or is it your case that India should use Pakistan, Bangladesh and Myanmar as the template when deciding the status of the Armed Forces in civil society? 2. The steep pyramid in the armed forces and the high rates of attrition at each rank, are features that exist due to the internal logic of the Armed Forces. My point, which has been twisted completely out of context by participants on your blog, was that the sheer size of the officer cadre of the Armed Forces makes it next to impossible to make a meaningful comparison with the much smaller IAS/IPS cadres. 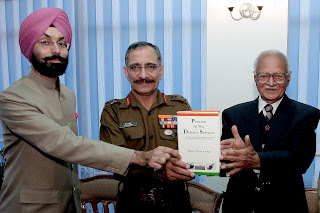 I feel the step to create a separate pay commission for the Armed Forces is a welcome move. Objectively speaking in terms of total emoluments, our Armed Forces are far better paid than other public services. Do we need to pay them more to attract youngsters? Definitely, but this cannot be an open-ended commitment. 3. The Armed Forces as well as the Police Forces exist to preserve the external and internal security of the nation. They are of course proud symbols of national identity but surely national identity and the task of nation building are dependent on other important categories of public servants and professions, especially engineers, doctors, teachers, artists and even politicians. For all of us in uniform, pride in our respective institutions is essential for organizational effectiveness, but it cannot be based on contempt for other institutions that are just as essential to a healthy nation. 4. On the issue of corruption, sir I think all our public services, including the Armed Forces suffer grievously from the cancer of corruption. Corruption in the police is perhaps the most talked about because it is the most visible, but if you seriously believe that the Armed Forces are immune to this evil then I think you are disregarding the obvious. The common man is not directly affected by corruption in our Armed Forces, that does not mean it doesn't exist or that it does not harm our nation. And pointing this out does not make me any less patriotic as many respondents on your blog seem to suggest. 5. My piece in HT appeared in grossly truncated form and it may have amplified my observations on the Armed Forces unfairly. It was initially prompted by the criticism of the Ashok Chakra awards to deceased police officers by retired senior soldiers. Sir it is nobody's case that Karkare and company displayed the kind of physical courage that was showed by Major Somnath Sharma or Lt Khetrapal or Havaldar Abdul Hamid. However please consider the fact that there may be the possibility of different contexts to and definitions of bravery. In the national imagination, I grant partly a media creation, what happened in Mumbai starting 26/11 was also a battleground and Shri Karkare and others were the first casualties of that engagement and the entire nation mourned them as martyrs. They went to their deaths willingly despite lacking the training, the equipment and the orientation to properly face the situation. Civil Society does not question your professional wisdom and integrity when you tell us Officer X or Jawan Y earned the PVC. Please respect the emotional wisdom and affection of civil society when it chose to honour them. In the limited experience of us civilians they were heroes. I wept almost 10 years ago when I saw the body of Captain Vikram Batra and I wept this time around too. We in the police don't have a very glorious or inspiring history as our Armed Forces, but even we love and revere our martyrs. 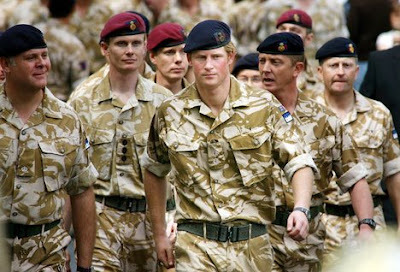 Please respect that if not as professional soldiers at least as gentlemen. The debate is open and your comments are welcome. Brigadiers commanding about 3ooo men were equated with an IG Police – the highest police rank in charge of an entire state. Lt Cols of the erstwhile Indian Medical Service (now AMC) commanding none were senior to the then second highest rank in the police hierarchy – the DIG. Colonels who used to hold staff appointments with zero troops under command were equated with the highest rank in forest hierarchy – the Chief Conservator of Forests. Lieutenant Colonels commanding less than 1000 troops were equated with the head of the entire excise machinery – the excise commissioner. Majors who rarely commanded more than 100 men were always equated with Imperial Police officers with 15 to 20 years of service who used to head districts which were larger than some states of today. So how is it that the status and pay were brought down ?. There is nothing in the successive pay commission reports which remotely suggests the depression of status of military ranks. In fact, pay commissions have made us believe that a status quo was always maintained between the pay of military and civil officers. Fine, but then how is it that a civil officer in the 3rd CPC grade of Rs 1650-1800 was granted Pay Band-4 with a Grade Pay of Rs 8700 by the 6th CPC while a Lt Col who was placed at Rs 1750-1950 was granted Pay Band-3 with a Grade Pay of Rs 7600 by the same Pay Commission ? How is it that a Capt is shown against Senior Time Scale under the 3rd CPC comparative table on Page 73 of the 6th CPC and suddenly is shown degraded and clubbed with 2nd Lieut and Lieut against the Junior Time Scale in the table representing 4th CPC – three military ranks equated with one civil grade and that too the lowest one !. There is nothing in the 4th CPC that suggests the downgradation of a Capt from STS to JTS level so how is it represented as such ?. Magic wand ?, No, but a crafty mind the execution of which escapes the untrained eye of not just the military but even the highest echelons of the bureaucracy and the cabinet. Again I would say that it’s those innocuous looking notes of the lower bureaucracy which hurt the most than anything else. As stated by me earlier, the pitfalls of accepting Abhinav’s arguments are many. Every single Group-A officer starts with the same salary under the Govt of India, if the ‘number of employees presided over’ argument is taken into consideration, then we’ll see most Group-A civil servants being placed below thanedaars or even havaldars. Within the defence forces, we’ll have officers from arms seeking superiority in pay and protocol over officers from the services. Professors of Universities and senior govt doctors and scientists would be down in the dumps because of the absence of those numerical attributes so much considered cardinal and vital by our friend Abhinav. 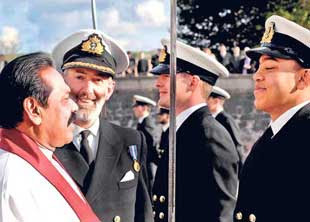 Recently, the Lankan President’s son got commissioned into the Regular Sri Lankan Navy. The pride is evident from this picture below. 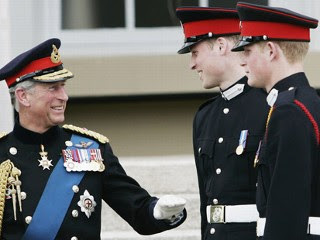 Also down below is Prince Charles with both his sons in military uniform. 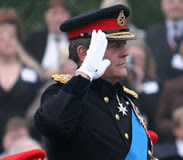 Major General Gerald Grosvenor, the 6th Duke of Westminster and the second richest man in the UK after Lakshmi Mittal can also be seen taking a salute. Gen Grosvenor who in recent times retired as a Territorial Army (TA) volunteer was the part time Assistant Chief of Staff (Volunteers and Cadets) prior to his release. The General also had the honour of being the Colonel-in-Chief of the Royal Mercian & Lancastrian Yeomanry and the Army Air Corps, Colonel of the Canadian Royal Westminster Regiment and Colonel Commandant Yeomanry of the Royal Armoured Corps, all in honorary capacity. Contrary to popular perception, India has also had its share of royals and political elite in the forces, after independence mostly as TA volunteers but the overall spirit is lacking and we could do with more politicians, members of political families and lawmakers in uniform. Politicians currently on roll of our TA are Maj Manvendra Singh, Barmer MP, Maj DY Sema, a Minister from Nagaland and Brig Sudhir Sawant, former MP and MLC who is currently the part time Deputy Director General (Infantry) of India’s Territorial Army. Is the young politico brigade in the hearing range ? Though I’m yet to see the order, it is learnt that the Hon’ble Supreme Court has dismissed the review petition filed by Union of India (Ministry of Defence, Govt of India) seeking a relook into the detailed decision rendered by the Hon’ble Supreme Court in UOI Vs SPS Vains case that was decided on 09 Sept 2008. In the said decision, the Hon’ble Supreme Court had upheld the order of the Punjab & Haryana High Court wherein it was directed that there had to be a system of pension parity between officers retiring on different sets of dates. While the case did not directly deal with the principle of ‘One Rank One Pension’, it definitely sets into motion a regime for near parity where there is minimal difference in pension vis-à-vis different retirement dates.